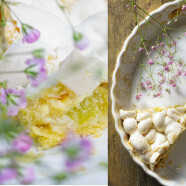 The cake is so delicious, the dough remains crunchy, the meringue soft and crispy with the rhubarb neither sour nor too sweet – simply indescribable! 90gr of butter Take butter out of fridge and allow to soften for about 30 min prior to using, it should still be of a firm consistence but not hard. 50 ml clear water Combine flour, butter (pieces) and cold water in a bowl, using your hands speedy mix moving from outside to inside (it is important to work quickly otherwise the dough will be too flimsy!). allow to rest for 24hrs Mix ingredients to make a chunky dough, then form to a ball and wrap into cling film, allow to rest in fridge for 24hrs. 6 stalks of rhubarb Peel rhubarb, cut off end pieces and remove strings, then cut into pieces of 1cm. 3 tablespoons of sugar Combine rhubarb and sugar in a bowl and set aside at least 15 min. 20gr of butter to grease Grease cake pan (porcelain, _ 24 cm / 3,5 cm height). shortcrust (remove from fridge 1h prior to using)1 hand full of flour Sprinkle flour on working surface, then using a rolling ping spread dough into a circle (35 cm) with a strength of 4 mm. Put pastry dough into the greased cake pan and carefully press in to the edges. Using a fork pinch dough all over. Then, using a knife, cut off excess dough. 4 tbls ground almonds* Sprinkle pastry dough with brown sugar and ground almonds. pieces of rhubarb Using your hands squeeze juice out of rhubarb pieces, then evenly spread on to pastry dough. 180°C / baking time 30 min Bake cake in oven for 30 min. 2 tbls vanilla sugar** Mix creme fraiche, egg and sugar in a bowl to a homogenous, creamy matter. Time to prepare / 5 min After 30 min take baked pastry dough with a golden brown edge out of oven and pour creme on top. 180°C / 30 min Put cake back in the oven and bake for another 30 min. 90 gr powdered sugar Beat egg white, as soon as it starts getting foamy mix in both kinds of sugar and keep beating till it becomes a white, elastic dough. Take cake out of oven and lower temperature to 150°C while keeping the door a crack wide open for 3min, then close again. 150°C / 30 min Using a spatula cover cake with meringue matter and bake 30min at 150°C, take out of oven as soon as meringue is crisp and has a golden brown color. The recipe may seem a bit complicated at first but if you slowly follow each step you will be awarded a wonderful rhubarb cake. * If no ground almonds at hand you can also use 60gr of peeled almonds instead and mix them.